From left to right: Herzog & De Meuron, Zaha Hadid, Rafael Moneo, Alvaro Siza, Eduardo Souto de Moura, PEter Eisenman, Le Corbusier, Mies Van der Rohe, Philip Johnson, Bjarke Ingels, Rem Koolhaas, Zvi Hecker, myself, Preston Scott Cohen, Michael Meredith, and Hilary Sample. Missing are Reyner Banham and François Dallegret, who were edited out because of space constraints. You can still see a portion of one of Fraçois’ ‘Automobiles Astrologiques¡ at each end, though. Woa. It’s been 5 months, already? It seems so, so (cacophony alert) before this blog is officially declared dead, I’m going to throw in some stuff that’s old enough to deserve some recovery. In February 2016, Uncube Magazine published an issue that had been in the works for quite some time at that point, ‘Walk the Line’, focusing on architectural representation and drawing in general. 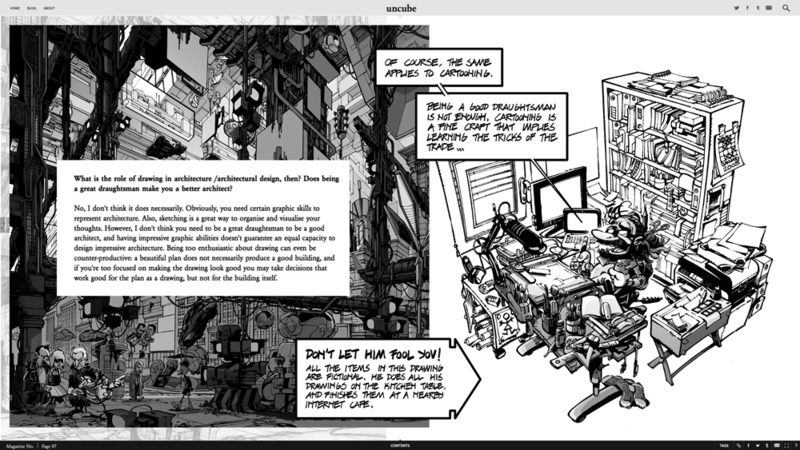 The issue featured an assorted group of interesting names, such as Wes Jones, Moon Hoon, William Chyr (of Manifold Garden fame), Sergei Tchoban, Raumlabor Berlin, and some others. At that point I had been the house cartoonist in the magazine for some three years, so Sophie Lovell, editor-in-chief, thought it might be worth having a little chat, illustrated with some ad-hoc cartoons. As usual, this happened at a point where I was swamped by work, which, adding to my proverbial sluggishness meant I ended up producing much less original work than I would have wished. It was a real shame, because by that time we knew the magazine’s run was coming to an end, and I would have loved to go out with a bang. Still, I’m glad we did it. 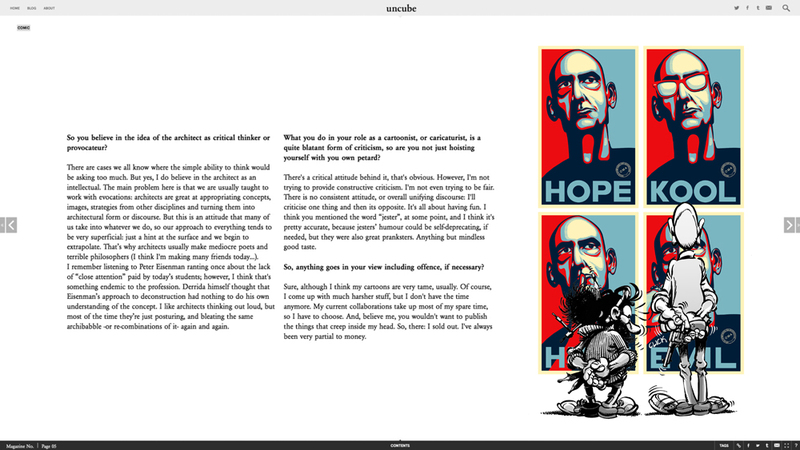 Oh, and that first page with the line-up of starchitects was a hoot to make. I think it would work great as wallpaper material. So, here’s the full interview. 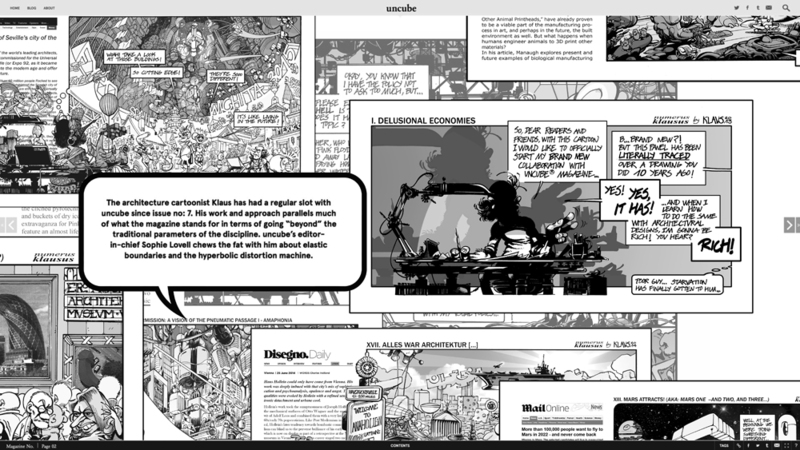 The architecture cartoonist Klaus has had a regular slot with Uncube since issue no: 7. His work and approach parallels much of what the magazine stands for in terms of going “beyond” the traditional parameters of the discipline. Uncube’s editor-in-chief Sophie Lovell chews the fat with him about elastic boundaries and the hyperbolic distortion machine. First things first: You’re an architect, aren’t you? Or at least you studied architecture at some point. Yes, I’ve been a registered architect for about 15 years now. I’m getting over it, though. I’m well aware that there are very elastic boundaries between architecture and (let’s say) beyond, but how does cartooning fit into your practice? It started when I was at the Harvard Graduate School of Design (GSD).I was about to start my PhD dissertation, which meant I was desperately looking for excuses that kept me away for it, and the GSD was a great provider of those: you had all these vedettes walking around, lots of stressed students living in their pods, loads of models piling up… it was eminently cartoon-isable. 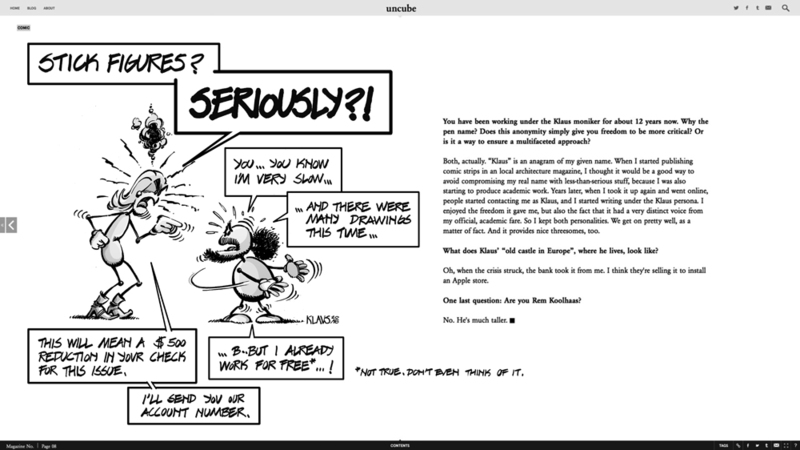 Then, one day Preston Scott Cohen had a hilarious conversation/argument with Ben Van Berkel, and I thought: “ok, I have to make a cartoon of this”. And that was that. Thanks, Preston. But, going back to the elasticity you pointed out: Yes, there is definitely a lot of disciplinary promiscuity nowadays, due to the decrease in – let’s call it – “traditional architect” work. However, I think that the 2008 crisis [SL1] exposed something that has always been there. Historically,if you had drawing skills and were good at maths, you were often automatically directed towards architecture, so over time, many learnt to vent their artistic urges through architectural design… some times more successfully than others. I think that nowadays, many people with an architectural background are just exploring the intersections between architecture and passions they sublimated through architecture, or some other ones they discovered at architecture school. A montage with some of the cartoons I did for Uncube during its 4-year run. There were about 30 of them, which makes it my longest collaboration to date. You can have a look at them by clicking the Uncube tag in this blog, or you can check the magazine’s website, of course. Many things. Many different things, that’s the point. And you don’t necessarily have to be all of them. In fact, you cannot be all of them. Whenever someone brings in that idyllic metaphor of “the architect as an orchestra conductor”, I feel the urge to ask the speaker to point me towards all these orchestras waiting to be conducted. The profession – and even the discipline – is changing and we need architects specialized in different fields, or people with an architectural background in other professions. And architectural cartoonists as well of course – but not many. Back off, it’s my pie. Well, yes, but also because it’s so easy to make fun of… egocentric characters have great comedic potential, and architecture education teaches you about narcissism. Also, we love trashing those who are more successful than us at – what we’ve been told is – our own game. There are cases we all know where the simple ability to think would be asking too much. But yes, I do believe in the architect as an intellectual. The main problem here is that we are usually taught to work with evocations[SL2] : architects are great at appropriating concepts, images, strategies from other disciplines and turning them into architectural form or discourse. But this is an attitude that many of us take into whatever we do, so our approach to everything tends to be very superficial: just a hint at the surface and we begin to extrapolate. That’s why architects usually make mediocre poets and terrible philosophers (I think I’m making many friends today…). I remember listening to Peter Eisenman ranting once about the lack of “close attention” paid by today’s students; however, I think that’s something endemic to the profession. Derrida himself thought that Eisenman’s approach to deconstruction had nothing to do his own understanding of the concept. I like architects thinking out loud, but most of the time they’re just posturing, and bleating the same archibabble -or re-combinations of it- again and again. What you do in your role as a cartoonist, or caricaturist,is a quite blatant form of criticism, so are you not just hoisting yourself with you own petard? There’s a critical attitude behind it, that’s obvious. However, I’m not trying to provide constructive criticism. I’m not even trying to be fair. There is no consistent attitude, or overall unifying discourse: I’ll criticize one thing and then its opposite. It’s all about having fun. I think you mentioned the word “jester”, at some point, and I think it’s pretty accurate, because jesters’ humor could be self-deprecating, if needed, but they were also great pranksters. Anything but mindless good taste. Oh, absolutely. We are no born as abstract thinkers, so we obviously learn through imitation, by copying. Some people may have abstract minds, but most of us rely on reactive mental processes, so we react to what we are shown either by copying it, negating it, twisting it (that’s when caricature enters the equation). What’s interesting to me is that, if you copy something sufficiently poorly, or you take exaggeration too far, it becomes something different. Double meanings work very in much the same way: humour is mostly based on twisting words, or looking at things from a deliberately twisted angle, which may, if done mindlessly enough provide with new, interesting perspectives that you would not come upon through realistic, or fair thinking. I see: the hyperbolic distortion machine, architectural caricature and distortion as a design force. You’ve spoken elsewhere about the “suspended reality of the cartoon” as a freeing design environment. You certainly have a penchant for fantastic architecture / architecture of fantasy. In contrast, in your architect persona, do you experience designing actual buildings as a straight jacket? Not a straight jacket so much as a task that requires too much effort in my case. Designing on a paper – or through a model – and getting to build something are related but not they’re not the same thing and you have to be willing to invest a lot of energy. I’m less and less interested in it as time passes. However, built architecture can compensate for all the things you lose when not working in the free reign of theoretical design. That said, non-build, or even non-buildable architecture, paper architecture, visionary architecture… whatever you want to call it, does encapsulate a inexhaustible capability for fascination. Many of us have a penchant for the visionary (not utopian, please) proposals of the 1960s, and the megastructural scene, in general. And, of course, it has to do with the fact that it was never (supposed to be) built. Almost 20 years ago I remember drooling over Zaha Hadid’s book The Complete Buildings and Projects. Each of those crowded drawings suggested so many possibiities… Then she started building, then AutoCad entered her office, and that was that. Well, except for her ill-fated stadium in Qatar –that was excellent cartoon-fodder. What is the role of drawing in architecture /architectural design, then? Does being a great draughtsman make you a better architect? No, I don’t think it does necessarily. Obviously, you need certain graphic skills to represent architecture. Also, sketching is a great way to organize and visualize your thoughts. However, I don’t think you need to be a great draughtsman to be a good architect, and having impressive graphic abilities doesn’t guarantee an equal capacity to design impressive architecture. Being too enthusiastic about drawing can even be counter-productive: a beautiful plan does not necessarily produce a good building, and if you’re too focused on making the drawing look good you may take decisions that work good for the plan as a drawing, but not for the building itself. Not my office. I wish I had a backlit drafting table. Or an office, actually. You have been working under the Klaus moniker for about 12 years now. Why the pen name? Does this anonymity simply give you freedom to be more critical? Or is it a way to ensure a multifaceted approach? Both, actually. “Klaus” is an anagram of my given name. 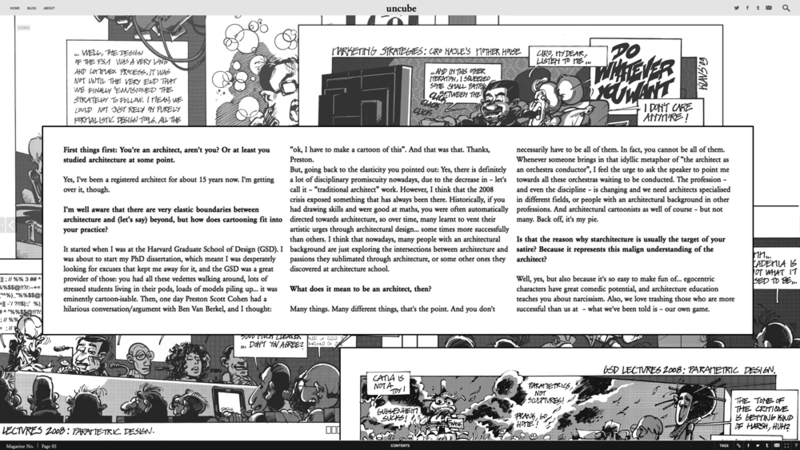 When I started publishing comic strips in a local architecture magazine, I thought it would be a good way to avoid compromising my real name with less-than-serious stuff, because I was also starting to produce academic work. Years later, when I took it up again and went online, people started contacting me as Klaus, and I started writing under the Klaus persona. I enjoyed the freedom it gave me, but also the fact that it had a very distinct voice from my official, academic fare. So I kept both personalities. We get on pretty well, as a matter of fact. And it provides nice threesomes, too. 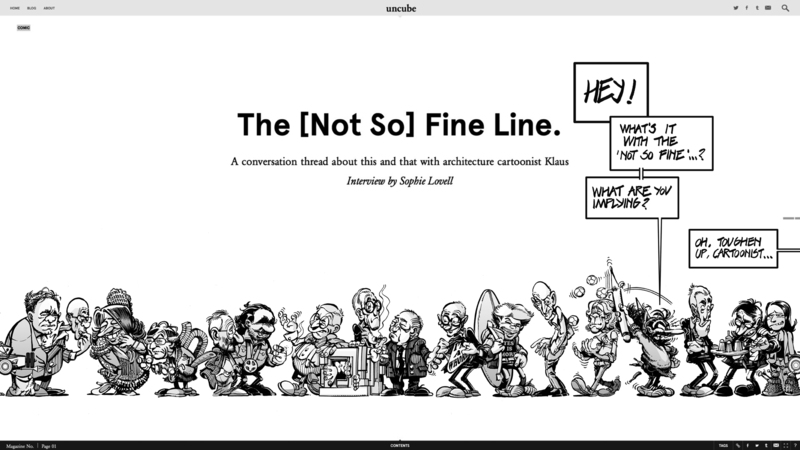 Sophie Lovell: “The [not so] Fine Line: A Conversation Thread about this and that with architecture cartoonist Klaus”. Uncube Magazine nº 42, February 2016.